We had Abinadi retested for allergies, but we have had so much difficulty introducing new foods and getting him off of the most basic of baby foods that we were trying to get a basic baseline and to then move forward from there. He had 50 prick tests and 25 patch. The pictur is from a week later and a bath later, his back was so small they had to do pricks all the way down his bottom. Good news is that he is not anaphylactic for any allergens, nor does he have any seasonal, environmental, or pet allergies. Yeah!!! 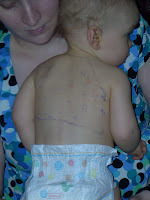 His patch test was a different story. Now Abinadi might have many more food allergies, this was just a baseline test to get us started. We will have to see what the future brings. He also has a contact allergy of Lanolin, fragrance, and CAPD, which are found everywhere in household products and mostly all soaps, and body care products. Which he will never grow out of, and buying hypoallergenic or fragrance-free does not guarantee that they are free of these allergens. The BIG news is that Abinadi most likely has ASTHMA. It is a daunting diagnosis but we have already started him on medication and it has made a huge difference in his lifestyle! Even with his eating because he breaths better. So what does this mean? We get to go exotic with meats, wild game and fish. And while he doesn’t have many household, environmental or seasonal allergies we need to get rid of them to help his asthma. The good news is that since we have been medicating his asthma, his ability to eat “grown up” food has improved. The doctor claims it is because when you eat you need to breath and when you can’t breath, you can’t eat. Who would have thought? Also he does not appear to have a soy allergy, so hopefully by the end of the year we can have both children eating soy. The problem; garlic is an allergy like soy that is in everything so the likelihood of him being able to eat out, or many processed foods will still be slim. Your poor kiddos. That must be awful for you all to go through that testing. I'm glad they were able to help Abinidi with his breathing, though. Congratulations on the baby boy!